The Bruising Adventures of Girl Clumsy: Will the real Clive Palmer please Stand Up? Will the real Clive Palmer please Stand Up? 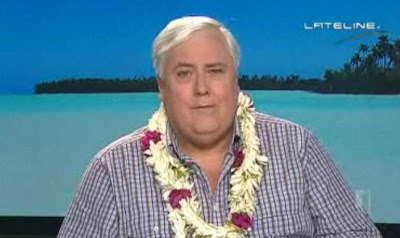 Billionaire mining magnate Clive Palmer treated us all to another one of his trademark media conferences yesterday. I've attended a few of these in my time, and they're always interesting affairs. The good Professor (Mr Palmer likes to be known by his honorary title) loves nothing more than holding court, throwing out crazy schemes and eccentric fancies like running for political office or setting up an online newspaper for all soon-to-be-retrenched Fairfax journalists. Listening to the audio of yesterday's 20 minute long debriefing on blueprints for his Titanic replica (aptly named Titanic II), a realisation hit me like an iceberg. Clive Palmer is a thwarted stand-up comedian. I put it to you, gentle readers, that Queensland's richest man built up his a multi-billion dollar business empire as well as significant political sway - in order to get an audience for his jokes. There is some physical evidence to back up this idea. Clive's Brisbane CBD headquarters, Mineralogy House, is equipped with a large media briefing room, as well as a smaller secondary one. Both can be customised with backing banners to suit whatever happens to be the Professor's message of the day. Both have ample seating for media hordes. He has been known to use both for different media conferences within minutes of each other; indeed, I attended the most famous recent instance of this in late April (the Titanic announcement, followed quickly by his now-abandoned plan to run in the federal seat of Lilley). It's a staging set-up that as a sometime theatre director I can only admire. But it's not a necessity; if there is signage at a media conference, it's usually a pull-up standee. Then again, Clive Palmer is no ordinary subject. He's a comedian. Comedians need a stage. And comedians need an audience. The evidence on tape and in print adds weight to this (pardon the pun, Professor). Clive - I should probably use the honorific Mr Palmer, but Clive just seems to suit him better - can't resist cracking wise. Even a fiery media conferences will still contain jokes, even if it's the one about how he's giving the press a headline (he loves that one). Yesterday's blueprint debrief attracted attention because the 58-year-old Palmer declared pensioners would be banned from the first-class casino on Titanic II. This was not, Clive said, because they were lesser beings, but rather because Clive doesn't want them to lose money. I mean, the very concept of that is hilarious. 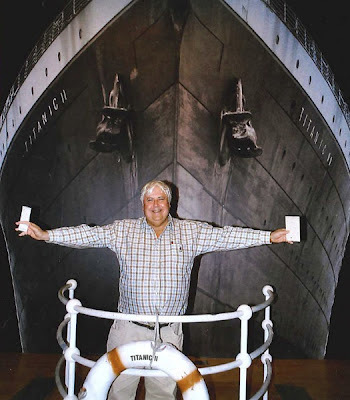 Someone who's forked out the thousands of dollars it will cost, even for a third-class berth on Clive's unsinkable ship, is surely not beyond dropping a couple of hundred bucks on roulette? It's not like he's setting up a leagues club up on the Sun Deck, ready to lure in tracksuit clad OAPs in oversize sunglasses and plastic visors for a few hours trying to win a free game feature on the pokies. During this beneficent declaration, Clive dropped some pithy one-liners. If you don't believe me, click open this instant rimshot sound effect in a separate tab, and hit that big red button at the end of every sentence. On who should be allowed to gamble: "If you can afford a first-class ticket … you can probably afford to go to the casino." On how casinos aren't that great anyway: "Go third class, that's where I'll be - that's where the fun will be." On possibly causing offence: "I love pensioners. My closest relations are pensioners." Every one of them, with the addition of a post-statement rimshot, works as a dodgy stand-up routine zinger. I came to Tahiti to get lei'd. Get it? Lei'd? Clive was born in 1954, placing him as a youth in the mid-1970s, when stand-up comedy as an entertainment form didn't really exist - in Queensland at any rate. I imagine young Clive, whose early career as a journalist segued into real estate, then National Party politics and state government (he worked for Sir Joh Bjelke-Peterson), wouldn't have had the time or outlet to develop his comedic skills professionally, before the lure of coal mining drew him away. Now, he's a gajillonaire (I believe that's a billionaire several times over). He's got money, he's got a venue, and he's realised he can get an audience any time he wants, for new material as well as the old favourites. We, the media, are the conduits for his performance fantasy; allowing you to share them on social media like you would a good clip of Louis C.K. or Patton Oswalt. Clive - I beg you. Accept your inner desire to be a stand up. Put together a tight five and hit the comedy clubs. You will let off some of that steam that's built up from not being able to express yourself the way you really want to. You've already got a backlog of jokes ready to go; plus there's that killer bit from earlier this year about the Greens being tools of the CIA. And don't worry - from my experience in the world of amateur stand-up, you wouldn't be half-bad. I await, with interest, the day when the Herr Professor prefaces a reply with "Now don't you worry about that"